There are a multitude of reasons why people need dentures and dental implants. Age, oral disease, injury, etc. all play a part. Thanks to modern technology, there are more choices for people today. Typically, conventional dentures are used after all teeth are removed from the mouth. When the teeth are removed there can be significant scarring to the gums, so an immediate denture will be put into place until these areas are healed. When the conventional denture can be worn it may take weeks or months before the patient has any comfort, because the muscles in the mouth are learning to participate with the new set of teeth. An obvious drawback to this is that the conventional denture comes loose. They are made to be removed from the mouth, so they may come loose or shift in the mouth. The dental implant feels more permanent in the mouth, like a new set of permanent teeth. Dental implants look and function like real teeth. 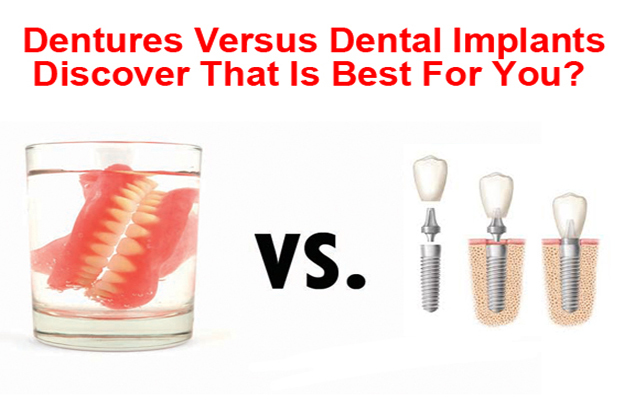 A dental implant is also much more stable, because the implant doesn’t rely on a messy adhesives to stick to the gums. While these implants bond with the bones in the jaw, a patient is provided a temporary restoration to go over the implant sites. When the sites have healed and are making a strong anchor in the jaw, a final restoration can be screwed onto the implants. With the implants in place, your smile will be restored, you will have the confidence to do the things that may hold back someone who wears a conventional denture. It’s literally like a new set of teeth in your mouth. Needing dentures doesn’t have to be the end of your confident smile.